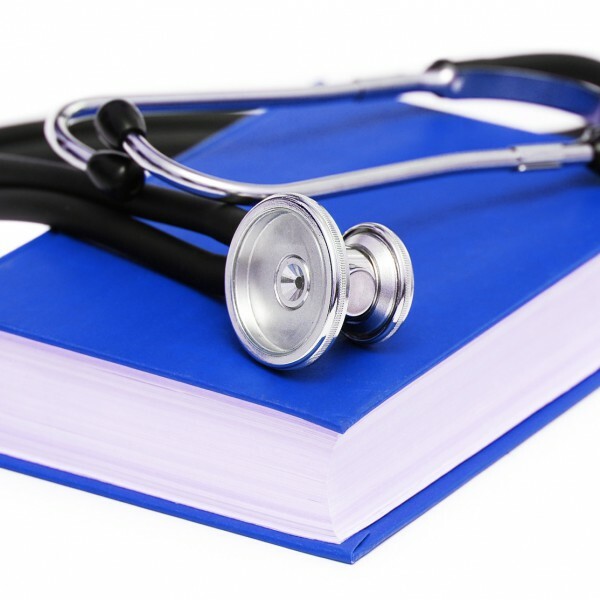 In our first installment, The Book Doctor is In: Introduction to Book Repair we presented the number one rule of book repair: Don’t try to fix everything. 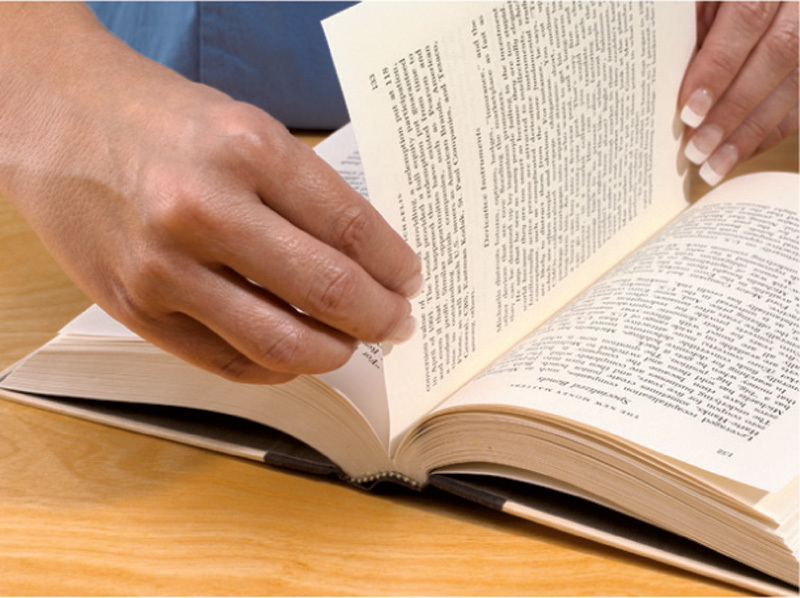 You don’t want to waste time and other resources repairing a book that no longer belongs in your collection. Nor do you want to deal with the frustration of trying to fix a book that is damaged beyond what you can handle in-house. The second rule of book repair, Make Repairs As Soon As Possible, serves as a reminder that it’s human nature to put off seemingly minor things. But I promise that if you re-shelve a book with a bit of minor damage to the hinge today, you’ll be re-casing the book next time you see it. Let’s be frank, finding a torn page probably won’t be the low point of your day. Still, it’s something that should be dealt with before it becomes more serious. It’s important to use a tape that will remain transparent and flexible for a long time so I recommend Scotch® 810 Magic Mending Tape. Others may work, but this has been my go-to clear tape for years. The taping process is straightforward: First attach the tape just beyond the end of the tear and smooth it along the entire length of the tear. 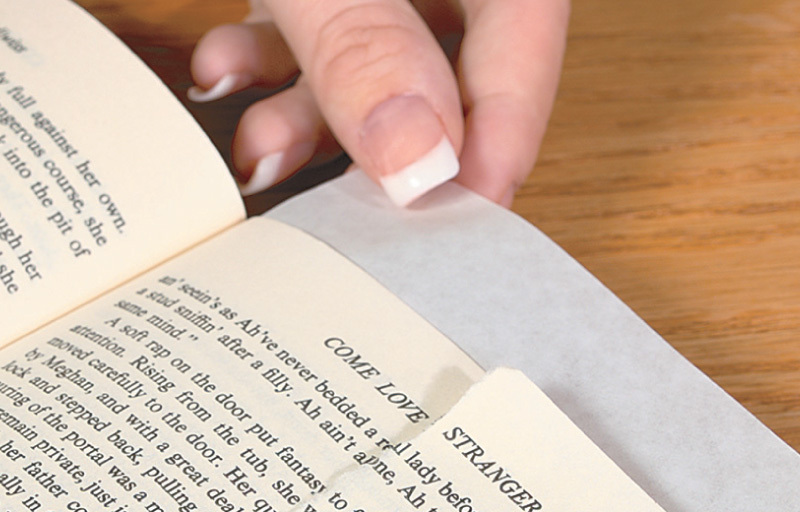 It’s likely that the tear will extend to the edge of the page so it’s best to cut the tape long enough that you can wrap about ½ inch of it over the edge to cover the other side of the tear. 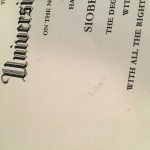 Don’t try to trim the tape even with the edge of the page as you’ll leave a rough edge that can snag and start a new tear. Note: it’s not necessary to apply a second strip of tape to the reverse side of the page with this technique. Smooth the tape with a plastic folder to ensure it adheres well. While this technique is simple, there is a drawback. Over time the tape will collect dirt along its edges since a bit of the adhesive may work its way out from under the tape. This may only be a concern in special cases. For example, on illustrations where appearance is a consideration using a good liquid adhesive is a better approach. 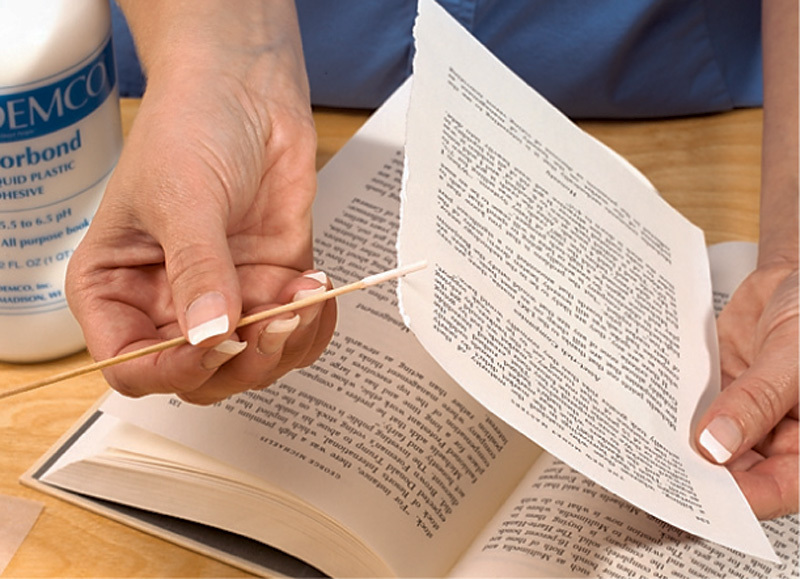 Since you will be using a liquid adhesive inside the book, be sure to slip a piece of waxed paper under the page you will be repairing. Have a second piece available to cover the repair before you close the book. Applying a small amount of a liquid adhesive along the edge of a tear is simple but does involve a bit more effort than merely taping. Use a mending stick to apply a small amount of Norbond™ adhesive evenly along the edge of the tear. Place the torn page on the waxed paper and, being certain that the two sides of the tear are overlapped correctly, press the repair with a piece of cheesecloth. Don’t rub the repair at this point or you’ll cause more damage. Once you have pressed the repair together, place your second piece of waxed paper on top of the page and gently run a plastic folder along the repair to ensure that it is flat and secure. Leave the waxed paper in place and close the book. Generally this repair will be secure enough to return the book to use in a couple of hours, but I recommend letting it dry overnight just to be sure. Remove the waxed paper — it will stick to the repair a bit but just give it a tug — and you’re finished. Take a little time and care with this repair and you will find that tear is all but invisible and won’t develop a dirty bathtub ring around the tape. Last time I promised to tell you about the most basic (and most often botched) repairs. 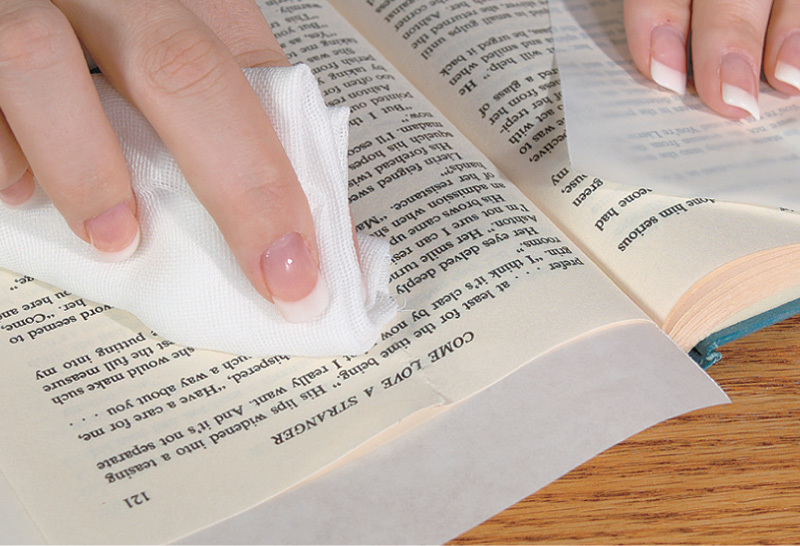 Taping a tear certainly qualifies as the most basic type of book repair, but reattaching a page that has come out of a book is no doubt the book repair that is most often done incorrectly. Unless you are very new to libraries, you have encountered books in which someone has tried to reattach a page with tape. Fail! In the vast majority of cases that simply can’t work because the adhesive on the tape won’t allow it to slip all the way into the gutter of the book. The page is taped to an adjoining page — usually a bit crooked and always sticking out of the book. The solution (only a minor pun) is once again a liquid adhesive. Demco’s Norbond™ is a polyvinyl acetate— liquid plastic — that’s formulated to remain flexible and strong over a long time. 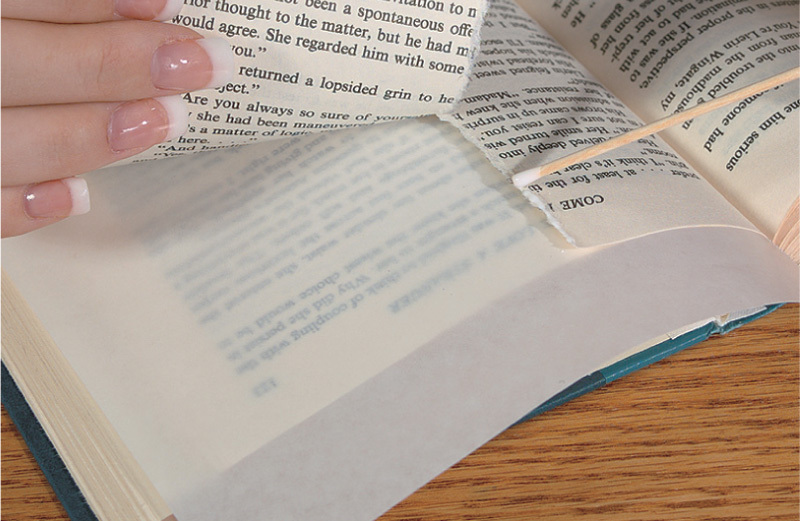 When you encounter a page that has been pulled out of a book, simply apply a small amount of adhesive along the edge of the page and slip it back deep into the gutter of the book. 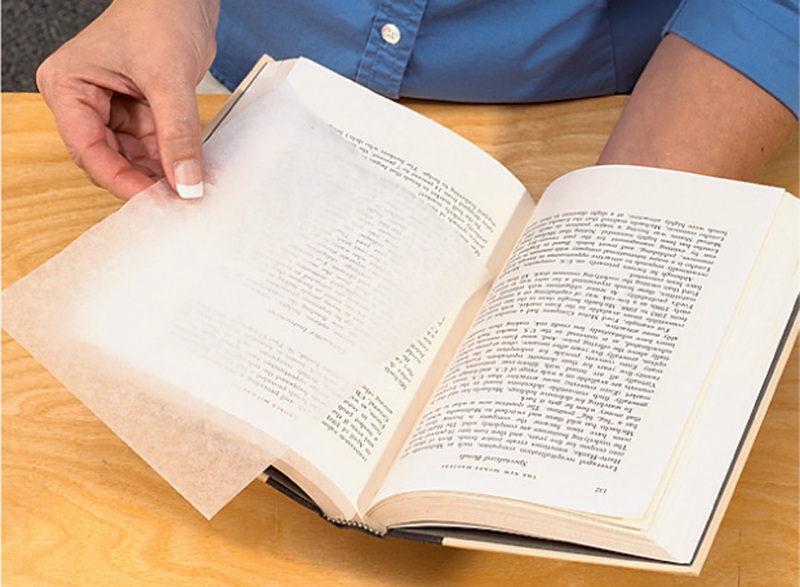 Since you’re working with a liquid adhesive in the book’s spine, it’s a good idea to slip in a piece of waxed paper on either side of the repair while you let it dry overnight. If you encounter multiple pages that have been pulled loose, you can generally reattach all of them in a single step. Just gather them together, check the page numbers and make certain the edges are even. Apply the adhesive to the inner edge of them all at once, being certain that each page has an even coat, and reinsert them all at once. I have found it helpful to use a spring clamp or two to keep the pages even until they are back in the book where they belong. Then remove the clamps and close the book to dry overnight. Since pages don’t always tear out neatly for you, the next blog post in our series will delve into some more complicated repairs. 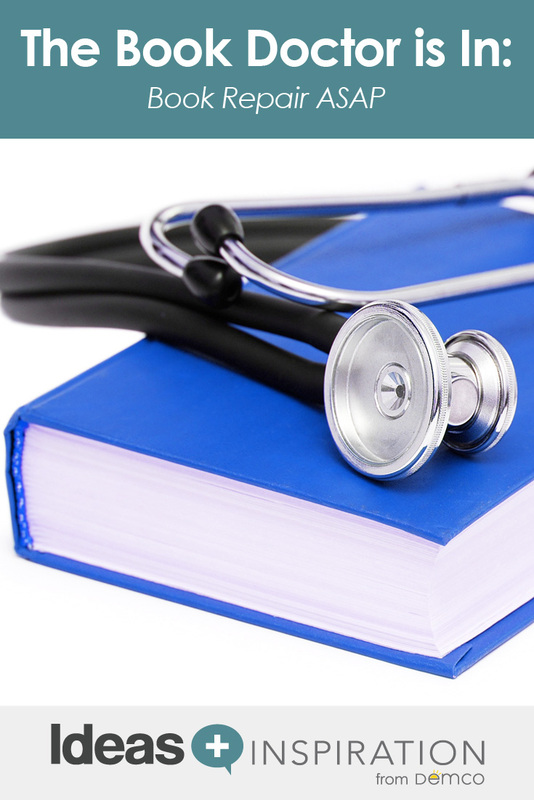 Throughout this series we refer to two resources from Demco. The Demco Collection Care Guide and the Demco Collection Care DVD. Both are available to help you complete tough book repairs like a champ. Also, if you send your questions or concerns through the Leave a Reply link below, I’ll be happy to respond. Great idea! Thanks for the book repair lession. Look forward to additional suggestions. Thank you for securing pages…had been doing it wrong for quite some time. Glad to help. Keep watching for new ideas. My toddler just ripped several pages of an old Bible commentary of my husband’s – a big corner chunk, ripped completely out, probably 5 pages. How do I nicely tape/bind/glue/(whatever) them back together? I’m sorry to hear about the damage but feel the steps outlined below should give you a good repair. I recommend that you avoid using any sort of plastic pressure-sensitive tape since that is likely to further damage the pages. Please refer to refer to the procedure outlined in the July blog post (“Torn Paper Repair”) and follow the steps detailed in the section headed Repairing Extensive Paper Tears. As we mention there, if the tears are fairly straight so you don’t have to use several pieces of tape on each one, the Filmoplast P Paper Mending Tape will give you a strong yet flexible repair. If the tears are very jagged you may want to use Book Repair Tissue and Demco Neutral Bond adhesive as detailed near the end of the July posting. Mr. Ison I am a collector of automotive magazines and my collection starts with the first issue. It goes back to Jan.1948. My copy is in good shape except the front and back page( printed as one sheet) have separated at the fold line. Is the value affected if it is repaired properly per your guidance or should I just keep it as is? I can’t say whether or not the value would be affected you the repair. My advice would be to leave it as is. Hello. I have a hardback, cloth cover book from the 30’s to 40’s that has some kind of paper residue on the front cover, as if something wet had been left on it. How might I remove it without damaging the cover? The cover is green, the paper is white. I had thought to get it wet, but was afraid of discoloring the cloth. It’s difficult to suggest something with any degree of confidence without knowing what has caused the paper to stick to the book cover. 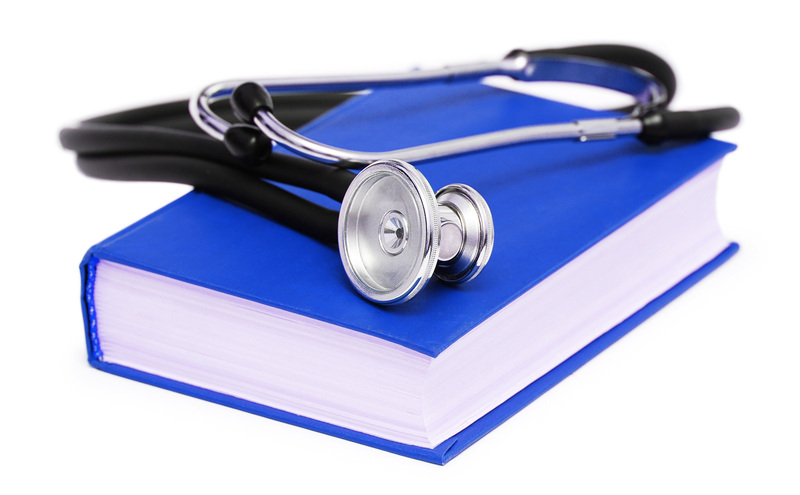 It is possible that something wet was placed on the book as you suggest in your question? If so, there’s a chance it can be removed if you moisten the paper and give it some time to soak. Since you’re concerned about discoloring the cover, first dampen and area inside one of the covers where the cloth is visible and use a white cloth to see if the color bleeds out readily. If it seems stable, there’s a good chance you can soak the paper loose — just be very careful not to get the cover too wet. Your problem is well beyond my area of expertise and I can’t offer advice on how to proceed. I suggest that you contact the following organizations, both of which specialize in recovery of seriously damaged materials. I have worked with these agencies in the past and am confident they will be able to assist you. I wish you good fortune in solving your problem. Thank you for contacting Demco. Many thanks for the resource links, John. We will see what help we can get from these places. 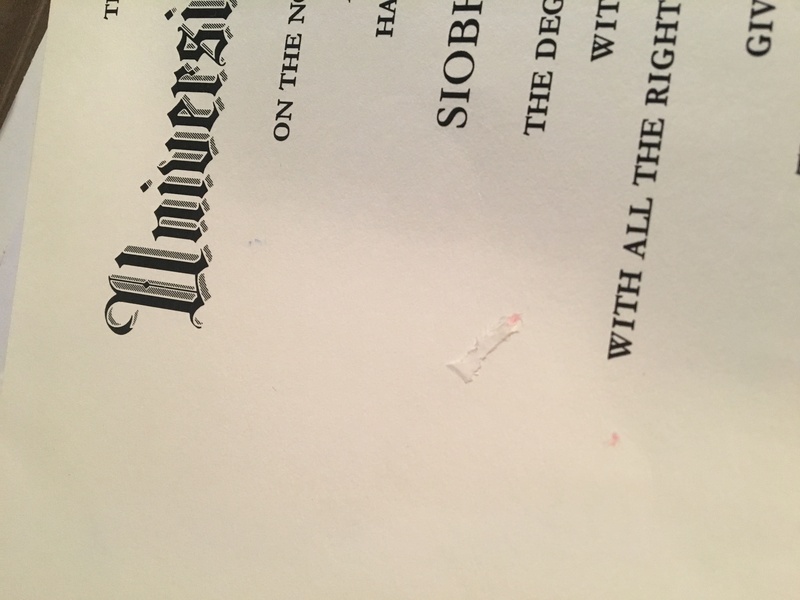 Hi, I have a diploma with a small surface tear. I’d like to repair by gluing down the tear and of course have it be as invisible as possible. what technique would you recommend? Thanks for including the photo of the damaged area. It appears that the surface of the paper has been scraped so it will be difficult to make an invisible repair. I think your best option would be to use a tiny bit of Demco Neutralbond adhesive in the scraped area and press the ragged edges of the damaged area back into place as much as possible. Once that is done, blot off any excess adhesive. Finally, place a piece of waxed paper over the repair and gently rub it to smooth the paper as much as possible. Let the adhesive dry completely before you remove the waxed paper.